If you have any questions and you can’t see the answer in the following please contact me by phone or email and I will be happy to answer your query. Can I choose to stop? Can I talk to you about anything? Is what I’m telling you confidential? What method of payment do you take and when do I pay it? What happens if I cancel or miss an appointment? Are you the right professional for me? Where does the counselling take place? Do you keep records/notes of my sessions? I offer an initial introductory session which is where we meet and I invite you to give me an overview about what it is that has brought you to counselling and what you hope to get from it. We can discuss your needs and work out what might be right for you at the time. At the end of the introductory meeting you may feel that you know whether you want to return and continue sessions or you may prefer to go away and think about it before making that commitment. We can talk through any concerns you may have and there will be no pressure, it is your choice. Everyone is different and it varies from person to person. 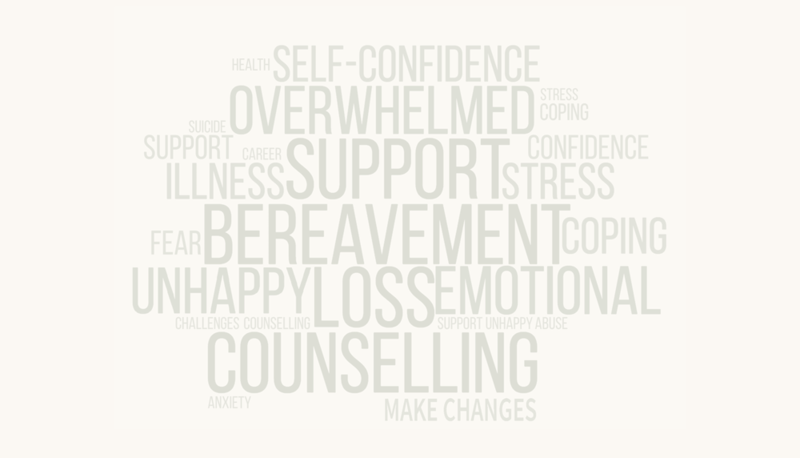 Once you have decided you want to give counselling a go we can arrange our next session and review as we go. It is your choice to start and it is your choice to stop. Even after one or a few sessions there is no obligation to continue. We can talk about how you are finding counselling, are there things that you are finding helpful or unhelpful, do you want to carry on or not or if you feel that now is not quite the right time for you or that your commitments are such that you feel you want to delay it until you have more available time that is fine. It is about finding what is right for you. You can talk to me about anything you want too, I will not judge you. There are times in life when you may encounter difficult challenges, feel overwhelmed, stuck, feel grief and loss and find yourself struggling. Things you thought you had dealt with may return and start to confuse you or every day challenges just get too much. In this relationship, my role is to listen and hear what you are saying and to support you in understanding and facing these fears and concerns. By working together, we can identify what is happening and work towards making changes. You really don’t need to face this alone. Often people start counselling thinking they want to talk about one thing only to find that they end up talking about something totally different. This is perfectly normal and it has often been said to me ‘my problem is trivial or silly’ It really isn’t, whatever is important to you is important to share in our sessions. I will listen and be there with you whilst we explore what is happening for you. Everything you say to me in our sessions is confidential, just between you and me. As a counsellor, I am required to attend and undertake monthly one to one supervision, this is where I discuss my working practice with my supervisor. I only discus the content of my work, I never mention names and no identifying information is given. Your anonymity is preserved. Through working with my supervisor I am supported in working with you in a safe and appropriate way so that you and I can work towards reaching the best outcome for you. However, there are exceptions to confidentiality where I am obligated and would not be able to keep certain information to myself. If it became clear that you were at immediate risk of seriously harming or killing yourself. I would try to talk to you about who we might contact, for example your GP. I would endeavour to discuss with you what we might do and find a way forward with a view to keeping you safe. If you were to tell me that you had harmed or were planning to harm someone, or that someone else was at risk of being harmed. Involvement or knowledge of child abuse or child safety. Knowledge of or involvement with Drug trafficking. Knowledge of or involvement with terrorism (required by UK law). I usually suggest weekly, especially in the beginning but I do understand that it can depend on your personal availability and finances. We can discuss this when we meet to ensure that whatever we agree on is manageable both timewise and financially for you. I offer short and longer term counselling and with either there will come a point when you will feel ready to stop counselling. So that you don’t experience an abrupt ending I often suggest that we space out the last few sessions to maybe fortnightly with a view to experiencing a planned ending. I accept payment by cash, debit/credit card, cheque or bank transfer. Fees are paid at the start of each session or if you prefer to pay by bank transfer it should be paid by or on the day of each session. Upon request, I can receipt payments. If you are a registered company or organisation I am happy to invoice you. I ask that you give me 24hrs notice if you need to cancel or rearrange an appointment. You can ring, text, or email me to let me know you need to cancel or re-arrange. My professional association requires me to work within my competence and training and this is my ethical and professional responsibility so should there be a time when I feel that the issues we are exploring are beyond my competence and training, I would consult with my supervisor, and it might be that it would be in your best interests to bring the therapy with me to an end. However, I would discuss all of this with you, and would make sure I could refer you to someone I felt was more suitable to help you, so that you could get the support you needed. Your best interest is my primary concern. If when we first talk or meet, it became clear that you are looking for a specific type of therapy that I do not offer for example REBT, CBT I could help point you in the right direction of a therapist who you might contact. The counselling session takes place in my counselling room in Ripe. However, I understand that for some people travelling and leaving their home can be difficult so in some circumstances I am able to offer Home visits so if you feel this is what you need please ask me and we can discuss in more detail. I maintain concise notes of our sessions. These notes are anonymous and are kept securely in a locked safe. These notes are a brief, factual record of the key elements from each session. My aim is that my notes should be respectful of each person I work with and under GDPR you have the right to ask to see any data I hold on you.